Sunken worlds become visible: the reconstructed Lake Dwellings at Unteruhldingen. 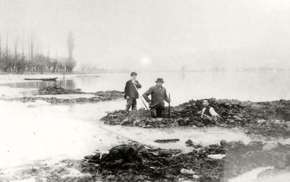 In a small bay near Obermeilen at Lake Zurich, the schoolmaster Johannes Äppli discovered during a cold winter when the water level was particularly low, remains of a human dwelling at the lake ground. Potsherds, axes and bones in between the piles could be identified by Ferdinand Keller, an archeologist from Zurich, as the remains of prehistoric settlements. He concluded that prehistoric people must have built their dwellings on piles into the lake. His work lead to excavations of the pile dwelling sites, not only in Switzerland, but also in all Circum-Alpine states. The unexpected wealth of finds caused an outbreak of “pile-dwelling fever” – even in Latvia and Ireland, the hunt for dwellings on piles at lakeshores had spurred the interests of archeologists. The beginning of history no longer started in Rome or Athens, but at the lakeshores. The first pile dwelling finds could be collected as early as 1856. Discoveries at Bodman followed in 1858. In Unteruhldingen and Sipplingen, the first research was conducted in 1864 und 1865. Soon the first objects found their way to the German cities Stuttgart, Karlsruhe, and Munich and became part of an exchange of archaeological artefacts between St. Petersburg, Berlin, London and Paris. Switzerland presented pile dwelling artefacts 1867 in the World Expositions in Paris. Paintings of artefacts and house reconstructions were shown in the Paris World Exhibition of 1889. The 20th century was marked by the confrontation with natural-science-related questions. Botany and Zoology as well as dendrochronology (tree-ring dating), provided new insights into the living conditions with new dating methods. It could be concluded that a dramatic lake level rise around 850 BC had forced the lake dwellers to leave the settlement. At the end of the pile dwelling phase, the people had retreated to the Hinterland. Deep diving research started after 1950 in Unteruhldingen. The method allowed excavating without having to drain the settlement areas and archeological sites. Starting in 1981, aerial archaeology made it possible to document the up to two-hectare large villages, with up to 100 inhabited houses each, from a great distance. The monument preservation worked intensively to collect and record the data about the settlement remains, above and below the lake water. Through the drying-out of the moors and wetlands and the changes of the natural lakeshores, a regression of the substances could be observed. Protective measures like the rewetting and renaturation will help to preserve the resources.